For some reason, it seems perfect that my 200th book of 2009 should combine a little of everything I tend to review. 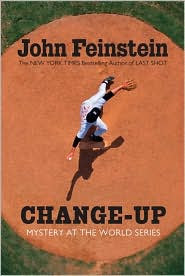 John Feinstein's Change-Up is a mystery featuring two teens. It's set during the World Series, includes real people, journalists, in it, and, even has a touch of romance and jealousy. So, there's mystery, young adult literature, sports, journalism, a little history with actual people, and romance. Thanks, John Feinstein, for winding up the year perfectly. Change-Up is the fourth book to feature teen sports reporters Stevie Thomas and Susan Carol Anderson. They've covered the Final Four, the U.S. Open, and the Super Bowl. This time, they're working for Washington newspapers, covering the World Series between the Washington Nationals and Boston Red Sox. It's Stevie who stumbles across a story featuring Nationals pitcher Norbert Doyle, who never pitched in the major leagues, and suddenly finds himself a starter. He raised two twins on his own after his wife was killed by a drunk driver. It seems to be a made-for-television story, but something's wrong. Susan Carol gets caught up in the story told by Doyle's glamorous son. And, as Stevie uncovers inconsistencies in the story, Susan Carol gives him the cold shoulder. After a few trips to Lynchburg, Virginia, where the accident occurred, Stevie is just more confused about the true story of Norbert Doyle. John Feinstein's teen mysteries always have a realistic atmosphere. Although the main characters are fictional, he peppers the story with so many real people and baseball anecdotes that the story rings true. Feinstein is an insider in the world of sports, so he includes Bob Ryan, from the Boston Globe and Sports Reporters, Bud Selig, Tim McCarver, and the entire Red Sox team. If there's a quibble with the story, it's Stevie's trip to Lynchburg, by himself, as an investigative reporter. However, what mystery doesn't demand a suspension of disbelief? Feinstein's stories are so enjoyable for the sports and mystery fan that it's hard to quibble with small points. I highly recommend all of John Feinstein's teen books to mystery lovers who enjoy sports. As I said, Change-Up has everything I ask for in a book. It's a perfect way to finish off 2009. Change-Up by John Feinstein. Alfred A. Knopf, ©2009. ISBN 9780375856365 (hardcover), 336p. Sounds like a very interesting book. I'll have to check it out. Congratulations on your 200th book. It is a perfect way to end the year. Can't wait to see what good bookis you share next year. Thank you. It was the perfect way to end the year. My son would have loved these twenty-five years ago. But I still have a grandson coming up. Those kind of terrific books weren't around 25 years ago, Patti. Fortunately, there are now some great authors writing for teens. I really like this series. Hopefully, your grandson will. Dropping back in Lesa, if you get a chance stop by Thoughts in Progress, I have an award for you. Oh, Mason. I'll stop by. Thanks, in advance! Great! I wish I could make time to read books. I love reading I just never have the time to finish a novel. It is inspiring though, how you have read so many books over the past 10 years and even remember which were the best. Thank you, Tunsie! Have a wonderful, safe New Year. I hope 2010 brings you the love of family and friends. http://ticketfront.com/event/Washington_Nationals-tickets looking forward to it.